Atman are a long established supplier of high quality professional Electrical Services through our great team of qualified, efficient and friendly engineers. All electrical installations deteriorate with age and use. They should therefore be inspected and tested at regular intervals to check whether they are in a satisfactory condition for continued use. Such safety checks are commonly referred to as 'periodic inspection and testing'. Once completed you will be issued with an Electrical Condition Report (EICR). Reveal if any of your electrical circuits or equipment are overloaded. Find any potential electric shock risks and fire hazards. Highlight any lack of earthing or bonding. Tests are also carried out on wiring and fixed electrical equipment to check that they are safe. 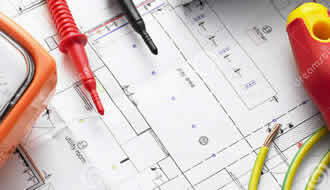 A schedule of circuits is also provided, which is invaluable for a property. 10 years for an owner-occupied home. 5 years for a rented home. 3 years for a caravan. When a property is being prepared for letting. Before selling a property or buying a previously-occupied property. Who should carry out the periodic inspection and what happens? Periodic inspection and testing should be carried out only by electrically competent persons, such as registered electricians. They will check the condition of the electrics against the UK standard for the safety of electrical installations, BS 7671 – Requirements for Electrical Installations (IEE Wiring Regulations). The adequacy of earthing and bonding. The suitability of the switchgear and control gear. For example, an old fusebox with a wooden back, cast-iron switches, or a mixture of both will need replacing. The serviceability of switches, sockets and lighting fittings. Items that may need replacing include: older round-pin sockets, round light switches, cables with fabric coating hanging from ceiling roses to light fittings, black switches and sockets mounted in skirting boards. The type of wiring system and its condition. For example, cables coated in black rubber were phased out in the 1960s. Likewise cables coated in lead or fabric are even older and may well need replacing (modern cables use longer-lasting PVC insulation). Sockets that may be used to supply portable electrical equipment for use outdoors, making sure they are protected by a suitable residual current device (RCD). The presence of adequate identification and notices. The extent of any wear and tear, damage or other deterioration. Any changes in the use of the premises that have led to, or may lead to, unsafe conditions. The competent person will then issue an Electrical Installation Condition Report detailing any observed damage, deterioration, defects, dangerous conditions and any non-compliances with the present-day safety standard that might give rise to danger. If anything dangerous or potentially dangerous is found, the overall condition of the electrical installation will be declared to be 'unsatisfactory', meaning that remedial action is required without delay to remove the risks to those in the premises.